Step 1 In a large saucepan over low heat, cook the olive oil, carrots, onion and garlic until softened, about 10 minutes. Step 2 Add the bouquet garni, lentils and 6 cups chicken broth. Bring to a boil, lower the heat, cover and simmer on low until the lentils are soft, 35 to 45 minutes. Check the soup periodically, adding additional chicken broth if necessary. Remove from the heat and stir in the lemon juice. Check for seasoning and correct if necessary. Step 3Ladle the soup into a soup plate or bowl, add a spoonful of harissa, a dollop of Greek yogurt and some cilantro leaves. Serve immediately. In Recipes-list.com we have selected the most viewed recipes from category - Main courses Quick and easy Soups . Enjoy the best recipes specially selected for you! 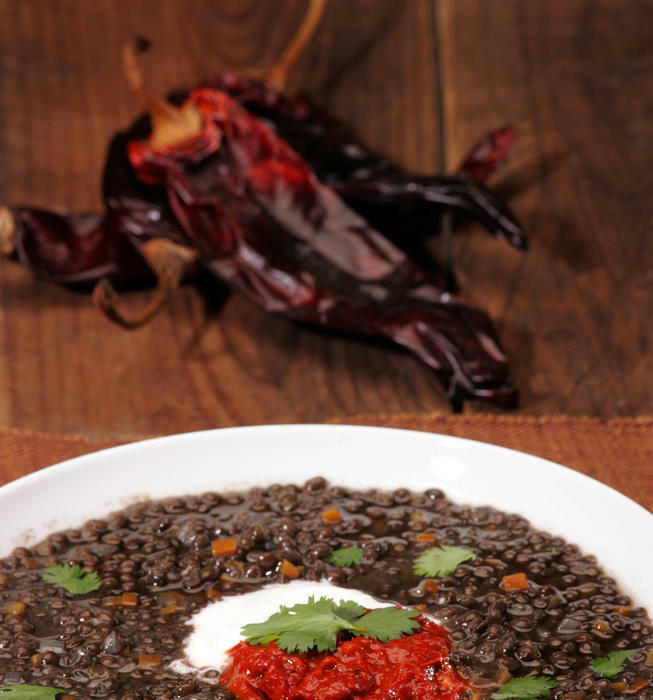 Beluga lentil soup with tomato-pepper harissa is the right choice that will satisfy all your claims.